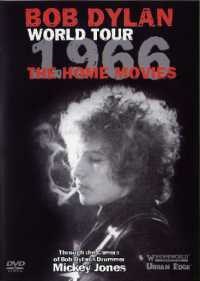 Now the Dylan industry ramps up impossibly further, following the excellent self-authoredChronicles and the BBC screenings of Martin Scorsese's meticulously assembled DVD No Direction Home, plus the related CD spin-offery... we get this semi-bootleg peripheral view of his Bobness. The backstory goes like this. Mickey Jones, a large jovial drummer with a burger habit gets drafted into Dylan's band in time for that first seismic electric tour. On a whim he takes along his 8mm Kodak movie camera to film his holiday diary. Then sits on the results for some three decades, until he realises - hey, there's history in this jerky often-blurry footage. So it's edited into a semblance of order spaced with tour photos by Barry Feinstein and, because home-movies at the time have no soundtrack, he voice-overs his amiable commentary... And the anecdotes are good, about how he go-betweens for the mutual-appreciation-society of Bob Dylan and Otis Redding, introducing them backstage at the 'Whisky A-Go-Go' where the Bobster offers Otis his newest song - Just Like A Woman, but Otis gets killed before he can commit it to Stax vinyl. Yet, at this merest suggestion, you can hear that never-consummated record in your head. But largely what you get is an endless stream of cigarettes and magazines, movies and factories, trains and boats and planes, with every now and then an occasional "there's Bob right there" glimpse of Dylan through a car windscreen as he glides past. You certainly get an impression of what it's like touring with Dylan, but little impression of Dylan himself. It's a scenic gig-by-gig document with a Dylan-shaped hole at its centre, there are fascinating insights for obsessive Dylanophiles - like me - but not much to offer those outside that magic circle. Armed with just a toothpick for emphasis Mickey's extended to-camera interview takes you through the drummer's life, from Houston, where he was born in 1956, to Grand Prairie where he grew up, through to his eight-year $10-a-night jaunt with Hispanic hitster Trini Lopez touring his If I Had A Hammer top 10 single and his Live At PJ's album, opening for the Smothers Brothers and supporting The Beatles at the Paris Olympia (cue unseen home-movie fragments). Then he switches to rocker Johnny Rivers' band for 1964-5 with a hike to $500-a-week and a package tour with English-invasion wimp-folkies Chad & Jeremy and drag-surfers Ronnie & The Daytonas, plus a USO tour of Vietnam bases alongside Ann-Margaret. Until it's in a side-booth at the 'Whisky' that he first meets Dylan, and settles for a negotiated $750-a-week. Now the live tour footage starts, in Hawaii where he's rooming with Garth Hudson - "not the neatest guy in the world" - across Australia for two nights at a Sydney boxing arena (13th and 16th April 1966), and a Melbourne TV show. Here, there's some rare too-brief aquarium-blue fluctuations of Dylan snatched from the monitor. For this tour Dylan does the first set acoustic while Mickey sits stage-side watching - "I was not only Bob's drummer," he confesses, "I was Bob's fan," then - more confrontationally, he uses a black telecaster with the band for the full second half. Playing louder the more they boo. Mickey has "a heavy right foot," and a howitzer for a bass drum. Dylan instructs him to "play simple," no fancy fills. And together they reinvent the Zim's early material, "time signatures was different, the metres different, I'm not sure that people listening even realised we were doing One Too Many Mornings, it was totally different". With Dylan accused of 'selling out', Mickey explains it was the opposite, the expense of lugging all that sound equipment around the world made it the most expensive loss-making tour he'd ever done. Mickey had known the other tour musicians when they were The Hawks, when Robbie Robertson, Richard Manuel, Garth Hudson, and Rick Danko were playing with Ronnie Hawkins, but it's only when the derisive press start in about "the band should go back to America" that they start referring to themselves as 'The Band'. As the tour progresses, they get tighter. Then "the tour that changed the face of American music" goes by BOAC VC10 to Stockholm, for "artsy-fartsy shots of Rick... Garth and myself being stupid" at Elsinore, Hamlet's castle in Denmark, a top-hatted D.A. Pennebaker filming Eat The Document at London's Mayfair Hotel, "my first experience with Guinness stout" in Belfast (the Dylan show is "louder than The Who, with headache-inviting drums" writes C.P. Lee in The Dublin Evening Herald), Ragland Castle, Gretna Green, the Paris Olympia, Liverpool where Mickey plays on the magnificent live B-side Just Like Tom Thumb Blues (Tuesday 14th May), the Manchester Free Trade Hall where the era-defining Judas bootleg - long erroneously referred to as the 'Albert Hall Concert' is taped. During the show, when Dylan switches guitar for piano on Ballad Of A Thin Man - "you don't know what it is, do you, Mr Jones" he glances across to drummer Mr Jones, "no offence" ... "none taken." Then two climactic nights at the Royal Albert Hall with Beatles and Stones in the audience... "One of the highlights of my career," gushes Mickey. Unfortunately, anyone expecting live footage of it all will be disappointed. Even the low-mix background take of Like A Rolling Stone and the rest are performed by Highway 61 Revisited, Mickey's Dylan tribute-band. Why did the audiences boo? "they didn't get it," explains Mickey, "we knew we were making great music. And now, they get it too." But what happens next is not the projected Shea Stadium concert with Peter, Paul & Mary, or the planned Moscow trip, but Dylan's mythic Triumph 650cc motor psycho wreck, out-of-action, into-traction. Dylan honours his financial contract commitment to Mickey, but tellingly, it's Levon Helm who resumes the drum-chair as The Band commence sessions for their soon-to-come Music From Big Pink album, while Mickey himself winds up playing ten years with Kenny Rogers. Later, Mickey's a bad guy in TV's The Incredible Hulk and in Arnie's sci-fi shocker Total Recall. And Dylan now..? To devotees he's "more a fantasy than a real person" but behind it, "he is the real person." So that's it then. But from a personal angle... in one sequence close-up he's clearly seen wearing Cuban-heel side-zip ankle-boots, exactly like I was wearing at the time. Synchronicity, style... or what?